For over a decade, BMW 2002 FAQ has provided the largest technical resource and community for BMW 2002 and BMW Neue Klasse owners. We work hard everyday towards promoting our hobby, users, and suppliers. Our Supporting Membership program helps fund our financial obligations while providing you online and offline benefits and resources as a BMW 2002 owner. Membership to the site will always be free, but if you would like to remove the ads and gain a couple other perks, please, chose one of the paid membership options. Supporting Member Moniker: Under your posts you will be seen as a Supporting Member. BMW 2002 FAQ Decals: You get two high-quality vinyl cut BMW 2002 FAQ decals. BMW 2002 FAQ Bottle Openers: Turbo and Alpina members will receive a BMW 2002 FAQ bottle opener. Unlimited Private Message Space: With Turbo and Alpina memberships, you will get all the space you will ever need and more to communicate with fellow 2002 owners. Private and Restricted Photo Albums: With Turbo and Alpina memberships, you will have an option of creating private photo albums. Win Prizes: Supporting members will be eligible to win free prizes. Become a Kugelfischer Member of the community. As a reward for your donation of $4.02 per month, $20.02 per 6 months or $35.02 per year, you will not see any external advertisements, the site will look cleaner and run a bit faster. 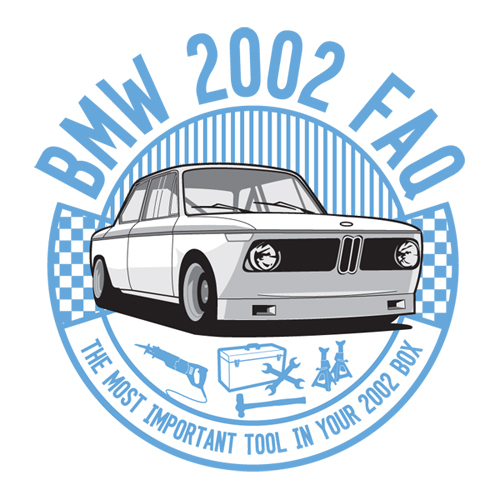 You will also get a pair of BMW 2002 FAQ Stickers. There is also a fancy title that will appear under your name. Become a Turbo Member of the community. As a reward for your contribution of $7.02 per month, $30.02 per 6 months or $50.02 per year, you will not see any external advertisements, the site will look cleaner and run a bit faster. You will also get unlimited Personal Message storage, ability to create Private and Restricted Photo Albums. Become an Alpina Member of the community. As a reward for your contribution of $12.02 per month, $60.02 per 6 months or $100.02 per year, you will not see any external advertisements, the site will look cleaner and run a bit faster. You will also get unlimited Personal Message storage, ability to create Private and Restricted Photo Albums, and an ability to upload Movies to the gallery. You will also get a couple of BMW 2002 FAQ Stickers, a Bottle Opener Key Chain, and discounts on our accessories at the store.